"Can you explain your place in the universe?" Picturehouse has debuted the first official trailer for a very peculiar, mysterious drama from the UK titled Out of Blue, from director Carol Morley. The film's story focuses on a detective who is investigating the shooting of an astrophysicist and black hole expert, but seem to lose her grip on reality and get lost in the existential concepts of time and relevance. Or something like that. Patricia Clarkson stars in this, with Jacki Weaver, James Caan, Toby Jones, Aaron Tveit, Mamie Gummer, Alyshia Ochse, Jonathan Majors, and Gary Grubbs. There are some interesting scenes in this trailer - moments where people disappear, very wacky lines of dialogue, but I am more than intrigued and very curious to find out what's really going on and what else this film covers. What big ideas it discusses, and how they work all that into the narrative. Definitely watch this trailer because it is so unique. When Detective Mike Hoolihan is called to investigate the shooting of leading astrophysicist and black hole expert, Jennifer Rockwell, she is affected in ways she struggles to comprehend. 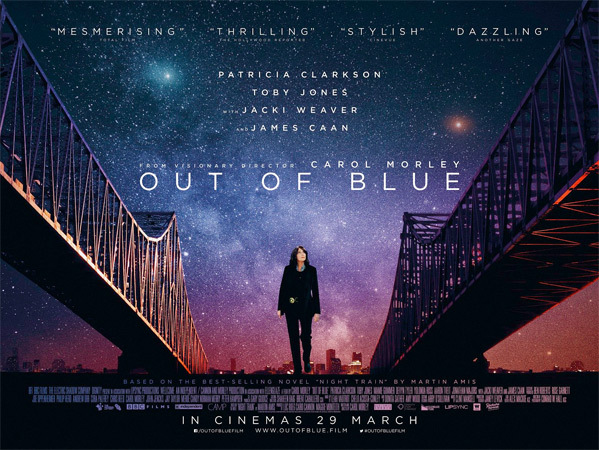 Out of Blue is both written and directed by BAFTA nominated English filmmaker Carol Morley, director of the feature films Edge and The Falling previously, as well as two documentaries The Alcohol Years and Dreams of a Life. Adapted by Morley, the screenplay is based on the novel of the same name written by Martin Amis. This premiered at the Toronto and London Film Festivals last year, but hasn't played at any other major fests besides those. IFC Films will release Morley's Out of Blue in select US theaters + on VOD starting March 15th coming up, and Picturehouse will also release the film in the UK starting on March 22nd. What do you make of this?